"It scarcely seems possible but it is nearly 15 years since Clive Christian launched his vision of the most beautiful perfume in the world, the No 1. He had wanted it simply to be the best. The “noses” with whom he worked were directed to have no consideration for cost, but merely to explore the rarest and most exquisite of ingredients and to come up with a memorable perfume that was the finest of the fine. That it also turned out to be the most expensive perfume in the world is simply because this is the cost when nothing but the best will do. The result is the No 1, so-called because it is, as Clive Christian himself always declares, “the perfume of my heart”. Since 15 years is a remarkable anniversary, Clive Christian wanted to give those who love this beautiful perfume a very special edition, both in tribute and in celebration. It has become something of a tradition to mark special occasions with innovative bottles for the Clive Christian No 1 perfume. Aficionados will remember the limited edition of ten bottles of the No 1 Imperial Majesty released in 2005. The bottles were hand-crafted crystal by Baccarat with Clive Christian’s iconic crown tops, each finished off with a 5 carat diamond. Then there were the 500 gold bottles released for the Queen’s Jubilee, as well as the gold-crown on the top of a gold bottle created in 2013, again in tribute to Her Majesty Queen Elizabeth II. And before that, there were the 2006 bottles decorated with Clive Christian’s original drawing for the No 1 crystal bottle, topped off with the house’s gold crown. Just a sample of the long line of creative designs all inspired by this great perfume. 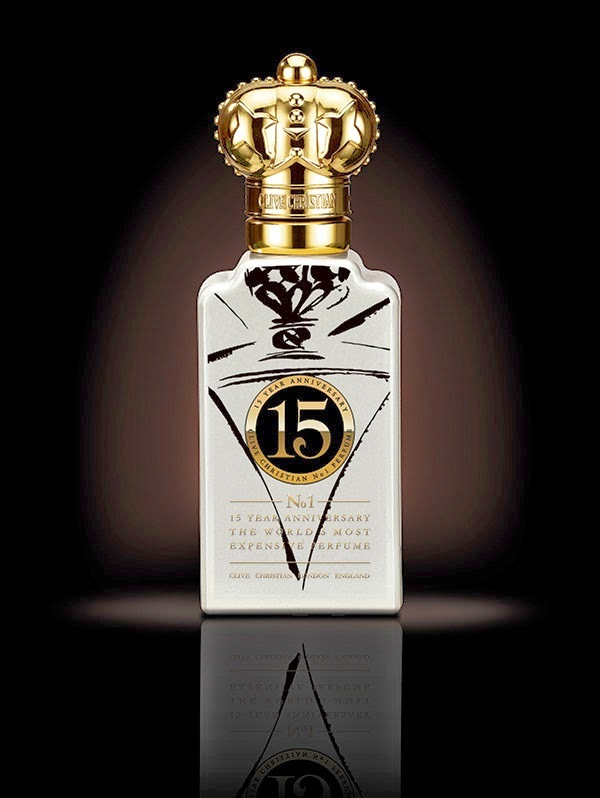 For the 15th anniversary, Clive Christian decided to take the house’s signature bottle and lacquer it white with gold in the detailing, and to top it off with the distinctive gold crown that is the mark of the house. Into these bottles he put the richer, more complex and concentrated versions of the No 1 perfume. The serene sophisticated Floral Oriental that is the women’s version and the distinctive understated Woody Oriental that is the men’s version have had their qualities deepened and enhanced by using high concentrations of the fine essential oils and essences that go into their making. As for the bottles themselves, each will hold 50ml of this most precious of perfumes and there will only ever be a thousand of them – 500 of the women’s and 500 of the men’s. Each will be individually numbered and once they are gone, that will be it. Catch it while you can before it disappears forever." The new limited edition will be available starting June 24th, 2014 priced at € 1,200/ £750.